South Korea's top national security adviser on Friday rejected talk of a possible downsizing of US troops on the Korean Peninsula. 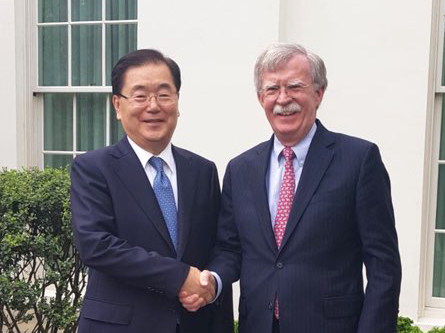 Chung Eui-yong, chief of the presidential National Security Office, told reporters after meeting with his US counterpart John Bolton, that such talk was also unhelpful. "I think it's unacceptable that the issue of the US Forces Korea keeps being raised," he said before his departure from Dulles Airport near Washington. "At my meeting (with Bolton) today, we reaffirmed the strength of the South Korea-US alliance and our joint defense posture." The New York Times reported Thursday that US President Donald Trump had ordered the Pentagon to provide options for reducing American troops stationed in South Korea. The report came just weeks before a high-stakes summit between Trump and North Korean leader Kim Jong-un, during which the US leader plans to negotiate for the dismantlement of the regime's nuclear weapons program. Asked if he doesn't think the troops issue will be raised at the Trump-Kim meeting, Chung said, "That's what I expect." "Certain media reports appear to have been completely groundless," he added. The Times report said that the downsizing is not designed as a "bargaining chip" in Trump's talks with Kim, but a peace treaty between the two Koreas could diminish the need for US Forces Korea. "Now, I have to tell you, at some point into the future, I would like to save the money," Trump told reporters Friday. "But troops are not on the table. Absolutely."